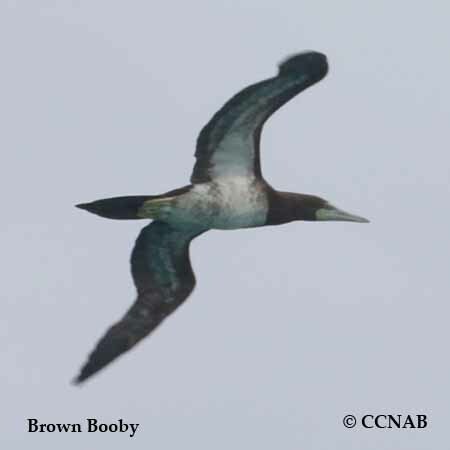 There are five types of boobies that have been reported seen on the oceans surrounding North America's southern waters, not including the Northern Gannet, which is part of their family. Boobies are large seabirds, known for their high dives from extreme heights into the waters below, shaping their bodies into dart-like forms in order to capture fish. The boobies that are seen are the Red-footed Booby, Blue-footed Booby, Brown Booby, Masked Booby and the Nazca Booby which can be seen on its nesting grounds in the Dry Tortugas Islands, which are sand formed islands off the coast of the Florida Keys. All these birds can be seen on the Pacific Ocean side, along the coast of Mexico, where they sometimes show up along the shores of the most southern states next to the seas.